Founded more than 20 years ago in 1997 by Dr. Anthony Lovat BDS., OPRO is the world’s most technically advanced mouthguard company and a leading pioneer in oral protection. From our state-of-the-art manufacturing facility in Hertfordshire, we’re dedicated to bringing cutting-edge technology, innovation, and safety to all athletes, at all levels of sport. For the professional athletes that wear our gum shields, support and inspiration are critical on the long road to sporting success. Over the years, we’ve been privileged to supply our gum shields to some of the world’s leading athletes, and are proud to be official sports mouthguard supplier to many international federations. To name just a handful, we’re proud to supply England Rugby, New Zealand Rugby, England Boxing, GB Taekwondo, the German MMA, and England Hockey with premium-level mouth protection. These athletes trust us because they know that when they wear an OPRO mouthguard, they can concentrate on their sport and be certain that their teeth and gums are protected by the best-fitting, most comfortable mouthguard in the world. We have used our experience and expertise in manufacturing custom-fit gum shields in the development of our self-fit range (fit at home products). 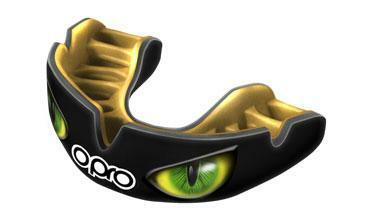 OPRO Self-Fit gum shields are suitable for all contact sports and provide excellent fit and retention through our unique and patented OPRO fins – ridge-like structures that break down when placed in hot water and then mould around teeth and soft tissue to provide a snug fit. This gives the wearer the best possible protection in a self-fit sports mouthguard. We love providing protection for athletes and enthusiasts of all ages and disciplines. You don’t have to be in the big leagues to face flying limbs and equipment! Our British heritage is important to us. All OPRO products are made in the UK and available around the world through a network of retailers and distributors. Our gum shields are CE certified, and in 2007 we were honoured to be awarded the Queen’s Award for Innovation in recognition of our ground-breaking work in the field of oral protection. As a brand, we’re passionate about the environment and make eco-friendly decisions where we can, from our recyclable mailing bags to the materials we use throughout manufacturing. Pushing boundaries is in our DNA, so we’re constantly researching new ways of improving our products. Our gum shields are now available with a Biomaster antimicrobial additive, which is proven to inhibit the growth of bacteria by up to 99.99%, keeping your mouth protected just as much off the field as we do on it. The first 20 years for OPRO have been an exciting journey and we’re looking forward to the next 20 years and beyond. No matter what the future holds, we’ll be following your sporting career as you continue to excel.